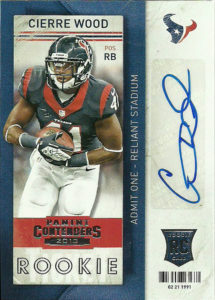 Here’s an interesting card from one of those blaster boxes of Panini I’ve become so loathe of recent. 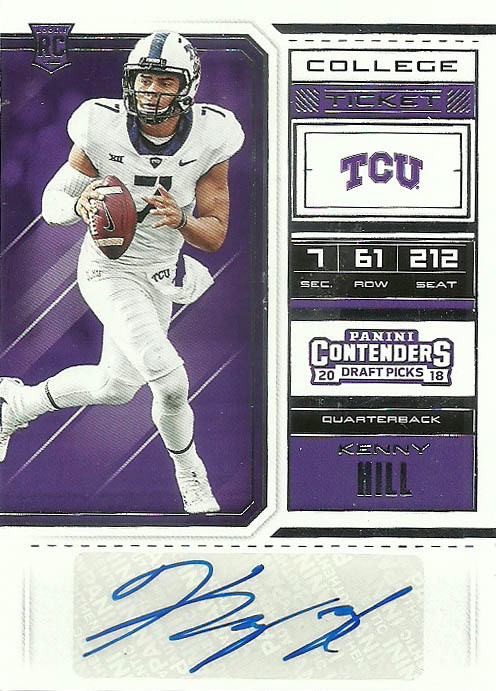 If I told you 4 years ago, Kenny Hill would be on a TCU card and not be enshrined alongside Johnny Manziel as a one of the Texas A&M great quarterbacks, you would think I was mad- but here we are. Backing up for Manziel for just one year in 2014, Kenny was handed the keys to the Aggies fortunes a year later. He would not disappoint in his first start- breaking Manziel’s single game school passing record (511 yards), and Jerrod Johnson’s single game school record (44 completions), against then #9 South Carolina. Almost immediately sensing an opportunity Hill trademarked his moniker ‘The Trill’ for promotional purposes- but after warming up against what turned out to be mid-tier talent, Hill’s number began to tail off against tougher opponents. After losing 3 straight games, he’d be benched- and then suspended for 2 games. Was the pressure too much at AtM or was the school just not patient enough? Who really knows? Whatever the circumstances, Kenny transferred to TCU in 2016. On the season it should be noted he threw 23 TDs to just 8 interceptions and completed 66.7% of his passes. After a subpar 2016, Kenny again lit up the scoreboard, bringing his signature style of football to the Horned Frogs posting almost identical numbers to his year as starter at AtM. In his final game he’d beat the Stanford Cardinal 39-37 in the Valero Bowl, as TCU finished ranked 9th in the nation. Kennny was unselected in the 2018 NFL Draft. He’d sign with the Oakland Raiders, but was quickly cut. Later he’d be picked up by the Montreal Alouettes of the CFL, but is rumored to be high on the wishlist of the upstart AAF San Antonio franchise. Garrett Fugate was a deep sleeper going into the 2017 NFL Draft out of tiny Central Missouri. In his final year playing for the Mules, Garrett threw for 3,657 yards, 31 touchdowns, and nine picks. A dual threat, he also rushed for 457 yards and 8 TDs on the year. He performed well at the school’s pro day, and scouts came away impressed by his ability to spin the ball. Ultimately however he was undone by the small school stigma and a previous ACL injury which he had fully recovered from, and went undrafted in 2017. At last count, at least 7 NFL teams showed interest in Fugate, but he was not signed. After going the whole 2017 season without football, Garrett found a home, signing a 2 year contract in early 2018 with the Montreal Alouettes of the CFL. 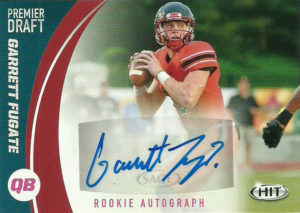 Good looking card here of Garrett as Sage attempts to shy away from the sideline sans pads images. Overall it is a pretty decent looking set, but Sage seems to be digging deeper down the list of available player names which is troubling when you look back at your autographs 2 to 3 years later and they are all free agents.